Circa 1924. 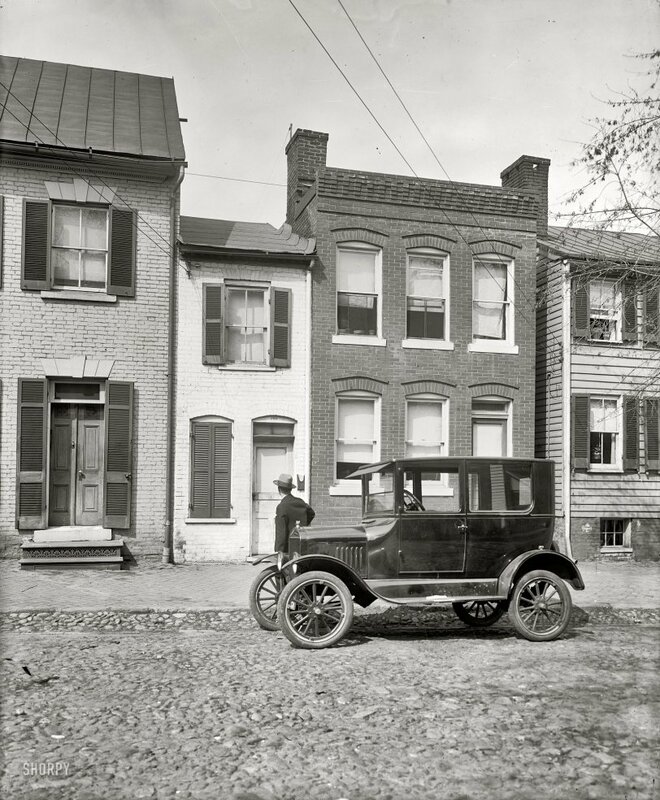 "Ford Coupe at 'little house' in Alexandria, Virginia." National Photo owner Herbert E. French examining that city's Little House (a.k.a. 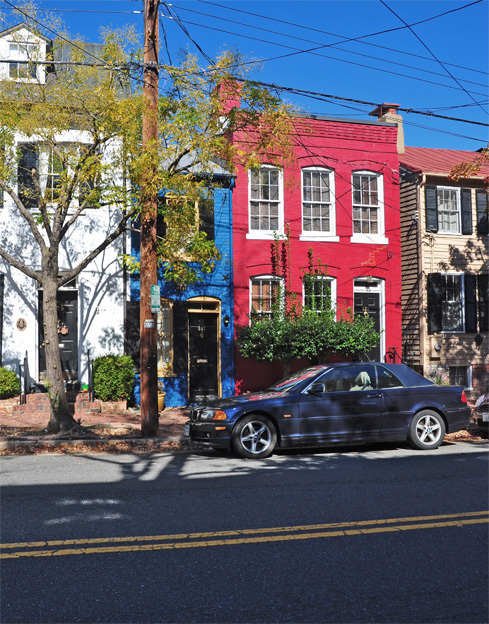 "Spite House") on Queen Street, a narrow dwelling with a long history. View full size. Submitted by TimeAndAgainPhoto on Fri, 10/23/2015 - 2:22pm. Below is the same view from October of 2015. Submitted by MacKenzieK on Sat, 04/25/2009 - 6:28pm. Submitted by Mike Cash on Wed, 02/25/2009 - 3:20pm. Now I know for sure I've been in Japan too long. After a quarter-century of seeing such rabbit hutch housing the photo didn't strike me as the least bit odd and it took me a while to figure out what there was unique or interesting about it. You want to see some oddly proportioned buildings, spite or otherwise, come over here. We have them by the bushel. Submitted by Mr. C on Wed, 02/25/2009 - 8:31am. ...that people were much thinner back then ! Submitted by C Kim on Wed, 02/25/2009 - 2:49am. The pictures in the NYT article are very good. Here is a virtual tour via the Washington Post from 2006, starting in the living room. Submitted by Ronnie on Tue, 02/24/2009 - 10:53pm. The Ford Model T in the picture is actually a two door sedan...A coupe of that era would not have a rear seat. Submitted by seagoon on Tue, 02/24/2009 - 10:42pm. Impossible to swing a rodent, let alone a cat!! Submitted by kevcoz on Tue, 02/24/2009 - 10:10pm. Submitted by Anonymous Arkie on Tue, 02/24/2009 - 9:53pm. Now that I've learned to use the highlighted links, I can recommend it to others. So it meant one less alley in Old Town! Marvelous. Good luck on doing something like that today!!! The minimum HUD bedroom dimension is, what, ten feet? Love it!